… And that’s how long 50 years feels. On 6th April this year, I completed half a century in this lifetime. Wasn’t it yesterday that I was crying when the train pulled out of Dehu Road station as Appa got posted to Shillong? And wasn’t it in the morning that I walked to KV Happy Valley and watched Lyngskor Ma’am jump over stones in her high heels? Didn’t I meet Krishnan before lunch, just as I watched a MIG 21 take off for the first time at AFA Dindigul and the massive storm came on in the afternoon and that unforgettable moment when I saw Krishnan outside NIIT Vizag’s gate … we got married just after that and yeah by dinner we were bankrupt !! Moved to Delhi and by the next afternoon, Krishnan had quit full time work after 32 years and a few minutes later, I had quit full time work after 23 years. ShikshaDaan was born and suddenly I realised that 50 years had gone by :):). I guess that’s how life is – blink, it comes on and blink, a decade is gone… keep blinking and minutes turn into hours into days into weeks into months, years and soon a lifetime. Krishnan and I always celebrate our special days, its just a practice that we are very particular about. This time, the Iyengar Yoga classes happened unexpectedly in March, so our original plan of celebrating my 50th birthday at Srinagar had to be changed. I then looked around Pune and homed in on Aurangabad because Krishnan has never seen the Ajanta and Ellora caves. I booked an Airbnb there when I booked the Airbnb in Pune. Then Krishnan gave me the fright of my life on March 6th with his health scare and it was also my birthday gift because it turned out to be just that – a scare and nothing more !! We immediately altered our plans assuming that we may have to take a flight back to Delhi rather than do the entire drive back. So I canceled the booking at Aurangabad and started looking at some options from Delhi. Within a week, we realised that Krishnan was absolutely fine and when we visited the doctor for a followup, he said Krishnan can do the road trip even right away. We immediately reverted to our original plan of leaving Pune on the 4th and stopping at Aurangabad to celebrate my birthday, before driving down to Gurgaon. It was a wonderful coincidence that we celebrated Krishnan’s 50th birthday at Taj, Fisherman’s Cove and my 50th was celebrated at Taj, Aurangabad. 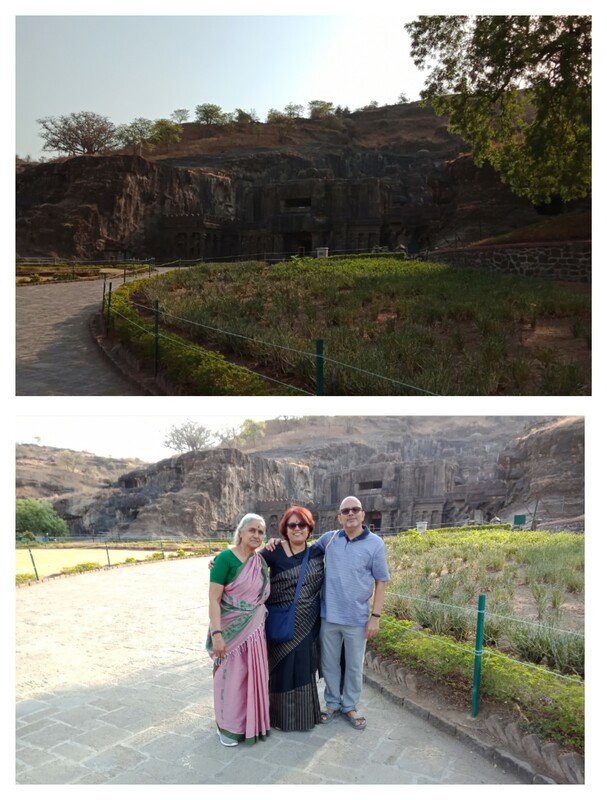 The heat was unbearable (41 deg C) so we decided to enjoy the cool air-conditioned comfort of the hotel room on the 5th and visit the World Heritage Site of Ellora early in the morning on the 6th. On the 6th morning, we ate an early breakfast and started out for Ellora, which is just 30 kms from Aurangabad. 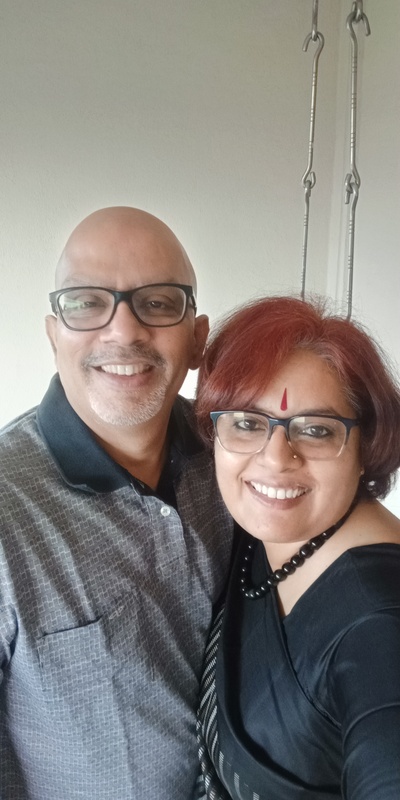 I wore my “Air India” Arani Silk Saree from Cooptex that I had bought in 2017 and kept aside for my 50th birthday, Krishnan wore his new track pant and Amma of course was in her new favourite, a Assam cotton sari that I had bought for her last year. The Kailas temple at Ellora is unique and probably nothing like it exists anywhere else in the world – its a monolith that has been carved from the top ! What you see in the picture above is the entrance to the temple and the whole thing has been carved from the top – this temple has no foundation. Its art at a totally different level and that’s why I wanted to celebrate my birthday here. Will write separately about the Kailas temple and the Ellora caves shortly. We completed our visit to the caves by 10 am and then visited the Grishneshwar temple near the caves. This is the 12th “jyotirlingam” and an important pilgrimage centre. No pictures allowed and rightfully so. We didn’t even carry our cellphones. The current temple has been built by Rani Ahilyabai Holkar in the 18th century, after the older temple was destroyed several times during the Mughal empire. We saw the Bhadra Maruti temple from the outside as it was getting too hot to walk out and Hanuman promptly dropped a tiny Mango on my head as a reprimand when we sat down to drink a glass of sugarcane juice a few minutes later. We had an early lunch and saw Bibi Ka Maqbara, the Deccan Taj Mahal again from the outside and got back to the hotel by 2 pm. 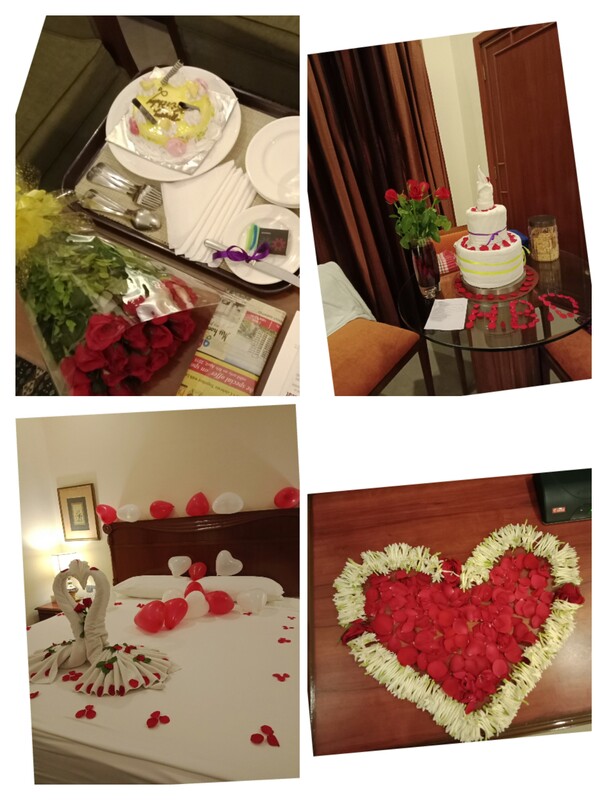 I walked into the room and saw that the team at Taj had decorated the suite with balloons and flowers and they had also baked a birthday cake. Ofcourse Krishnan had colluded with them :):) and I was happy with the result of the collusion. I love balloons especially because Appa would never get them for me when I was younger, as he was scared that I would suffocate accidentally. All through the day I received several calls from all my friends, family and well wishers. My Facebook and Linkedin profiles had hundreds of messages, WhatsApp kept buzzing and I was truly overwhelmed. I have just managed to thank everyone on Facebook and will now get to Linkedin and do the same. Anyone that I missed, please know that I deeply appreciate all your wishes and it was totally inadvertent. You bet !! After all Man landed on Moon in 1969…. all of us born in 1969 should atleast aim for the stars, no less. Could you please provide me the link to your FB profile so that I may follow you ? Congratulations Bindu for coming past this side of 50 years. May you be blessed with many more returns of the day. Congrats Malu. Wishing you very many many happy returns of the day. Thanks Koka … you were there right at the start of my life !! And special thanks to Periyamma for choosing me over her sister :):):).